Last week I flew up to Johannesburg as my sister is visiting from Australia with my nieces. I stayed with my parents and got to spend some time with friends, as well as my mother-in-law. I went to have morning coffee with Marguerite and beforehand I went shopping at the Woolworths on Grayston Drive. I chose a selection of biscuits, chocolates and carrot cake and my mother-in-law and I indulged in a decadent mid morning snack. I also left her with enough treats to last the week before she moved to Hoekwil. When my mom got home I told her that Woolworths had a special of 20% off stollen and lebkuchen. My mom is of German descent and Christmas always means lots of cookies and slices of stollen. She told me she doesn’t have a good recipe for stollen and has not made it in years. I knew there was a recipe for my bread maker and I told my mom I would make the stollen and if it was great, I would send her the recipe. You don’t need a bread maker for this recipe as you could do the kneading in a mixer, or by hand if you prefer. It was just good fortune that two of the challenges I try and do each month have stollen as the ‘to do’ recipe. I’ve now killed three birds with one stone! I placed the ingredients into the bread maker and Dave and I left to get one thing from the shop. That one thing turned into 5 and we were out of the house for over 3 hours. When we got home it was hot, and the stollen proved amazingly well. It is summer and nearly holidays and I will be making more breads to enjoy and share with you. I am submitting this recipe to Meeta’s Monthly Mingle, which is being hosted this month by Jungle Frog Cooking and to Twelve Loaves which is hosted by Jaime, Lora and Barb. I am thrilled to have found this recipe, Tandy. I have been looking for a Stollen recipe for Christmas this year. 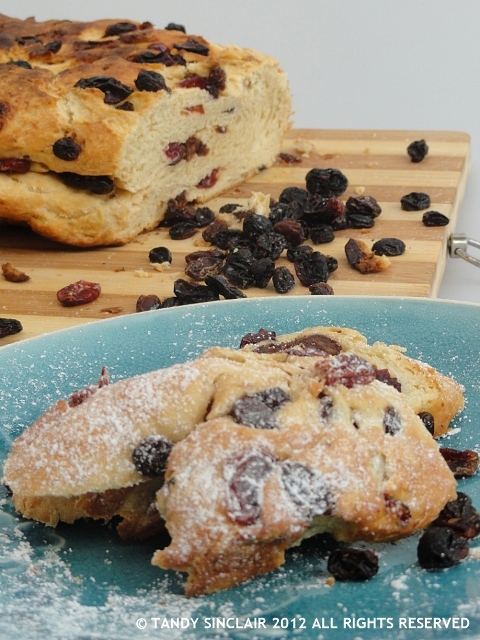 This looks great, I love stollen and must try to make my own one day! I adore stollen ever since having it fresh overseas! The ones that we get here are packaged and not so fresh but a fresh one is a thing of beauty indeed! One of my favorite holiday treats. This sounds like an easy recipe for your mom. And stollen is one of the best Christmas treats! I love a good stollen but unfortunately for some reason mine haven’t been what I want them to be so I am still working on making the perfect one. This does look pretty good so maybe I should try your recipe. Thanks for taking part in the Monthly Mingle this month! We eat panettone at Christmas (you did a recipe last year if I rememeber which seriously impressed me!) but I really like Stollen and have often thought I´d like to give it a try! Well done on yours, it looks great and so glad you got to spend time with your family.